Dr. Christopher Green is a licensed chiropractor offering expert care for patients in Estero, FL; Bonita Springs, FL; Fort Myers, FL; Naples, FL; and San Carlos Park, FL. Chiropractic is a non-invasive, drug-free form of healthcare focused on relieving disorders in the nervous and musculoskeletal systems, while improving general health and wellness. Typically patients see chiropractors for neuromusculoskeletal complaints like back pain, neck pain, headache, joint problems, or pain in the arms, legs, and hands. After a musculoskeletal injury, the tissues surrounding the spine or affected joint can become inflamed and restricted. Tissue injuries have a number of causes, including auto accidents, overuse injuries in sports or at work, stress, and poor posture. Chiropractors use chiropractic adjustments, sometimes referred to as spinal manipulation, to restore mobility in the restricted joints of the spine after tissue injury. During an adjustment, chiropractors use their hands or an instrument to apply precise, gentle force to a specific areas of the spine. This technique is often accompanied by spinal mobilization, massage therapy, and exercise rehabilitation. Time and time again, we've seen firsthand how this integrated treatment approach is effective for our Estero patients with musculoskeletal problems. The effectiveness of chiropractic care for a number of musculoskeletal conditions has been repeatedly confirmed by medical studies. 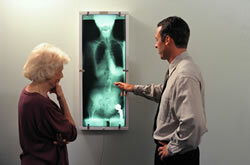 Chiropractors like Dr. Green specialize in the proper functioning of the central nervous system (CNS). Made up of the brain, spinal column, and nerves, the CNS is responsible for everything from breathing and heart rate to regulating blood pressure and immunity. The CNS serves as the main line of communication between the brain and the rest of the body. Spinal nerves reach out from the spinal column to the rest of the body to transmit nerve signals from the brain. Dysfunction within the spine may disrupt this communication by interfering with the transmission of nerve signals. Dr. Green works to identify areas of dysfunction within the spine to relieve pain and improve the overall health of patients in Estero, FL. Whether you're recovering from an auto injury, work injury, or are simply suffering from ongoing pain, Chiropractic Care and Rehab Center can help. Our massage therapists and chiropractors can provide you with effective pain relief, while helping you attain your health and wellness goals. Call our office in Estero, FL for an appointment today.